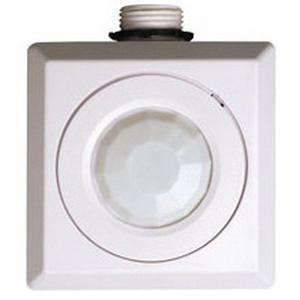 Cooper Industries Greengate® High-bay occupancy sensor features passive infrared technology. This sensor requires 120/277-Volt AC voltage for operation. It measures 3.08-Inch x 3.08-Inch x 1.7-Inch. This sensor is suitable for warehouses, manufacturing, garages and high ceilings. 36-Inch wire lead terminal connection. The zero-crossing technology ensures long relay life by switching high-inrush equipment at close to zero power. It is compatible with electronic ballasts, incandescent lighting or motor loads. This sensor is fixture mounted at height of up to 40 ft. It operates at temperature of 0 to 40 deg C. Sensor is UL listed and FCC compliant.